This Mediterranean 7-Layer Dinner Dip is perfect for one of those evenings—it still has enough healthy ingredients, protein and calories to keep us satisfied (plus it meets half of our daily goal for dietary fiber!) and it doesn’t require any cooking at all. Of course it would also be a hit at any party. 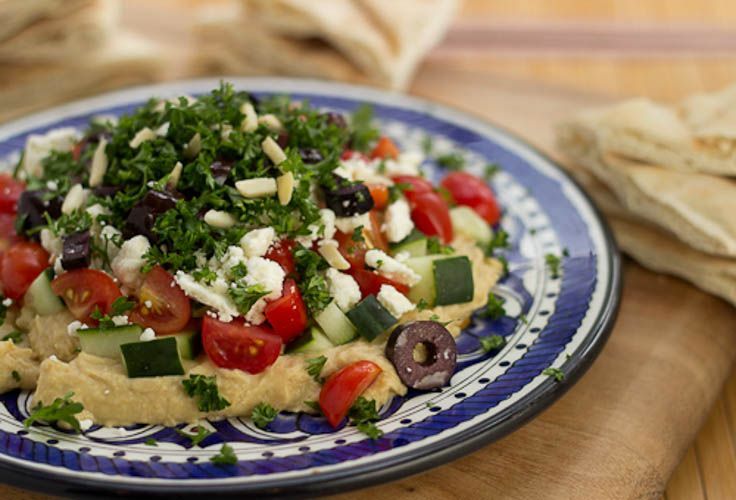 Spread the hummus an 8- or 9-inch round dish or pie plate, and top it with the remaining ingredients in order. Meanwhile, warm the naan or pita in the oven at 300 degrees for 5 – 7 minutes. Scoop up the mixture with naan or pita bread or pita chips, or wrap the dip in a piece of naan and enjoy as a sandwich.